on Sat 3rd Nov or other surplus food extravaganza, please email DiscoSoupOxford@gmail.com, with your name, phone number and a hello! – foodies remember the 3rd November, to cook up your Halloween pumpkin and squash! Don’t be too spooked to join in, we’d love new volunteers! If you love to cook, or would like to meet others interested in food and who hate wastage through the medium of cooking, or would love to help decorate and provide music for a fun, interactive event in the city centre; then get in touch! ALL WELCOME to help on Saturday 3rd November 2018! The last Disco Soup was Disco Soup #5 on Sunday 5th November! More info here:- https://www.facebook.com/events/367203750372983/; and the one before was on SUNDAY 16th October 2016, World Food Day! More info HERE! To find out more about what Disco Soup is, read on…. 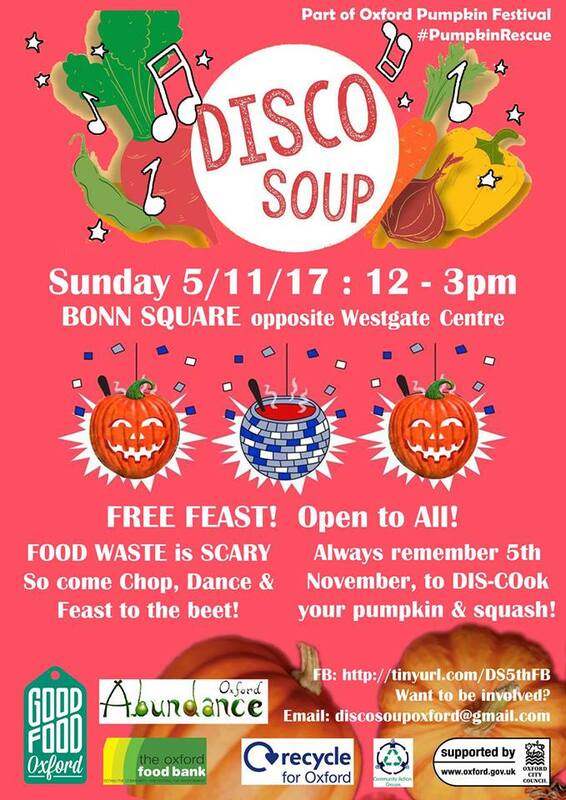 Disco is back to squash food waste with a pumpkin theme… SAT 1st NOV, 12-5 at Bonn Square (opposite the Westgate Centre). Free Food for ALL, Live Music, Great atmosphere. Be there or be pear! #DiscoSoupOxford (Disco Soup #5) took place on 5th November 2017 with a great team of volunteers turning Bonn Square into a dancing, music-filled, chopping-feasting- and chatting-about-food-waste extravaganza. #DiscoSoupOxford (Disco Soup Oxford #4) took place as part of World Food Day 2016. We had disco tunes, live music, lindy hoppers dancing and cooked up delicious food from surplus that otherwise wouldn’t have been eaten, and fed hundreds of people! Disco Soup Oxford #3 took place in Bonn Square on Saturday 1st November and was free for all to join in. We fed 800+ people free soup from produce that would otherwise have gone to waste! Disco Soup is a FREE COOK-UP & FEAST with LIVE MUSIC, feeding on average 700+ people with food that would otherwise have gone uneaten. Find out more about the international Disco Soup phenomenon below…! Disco Soup #3 was part of the Oxford Pumpkin Festival: a series of engaging & fun events highlighting food waste in Oxford, using the pumpkin as a prime example of food we throw without thinking! Here’s the blog on DS#3! 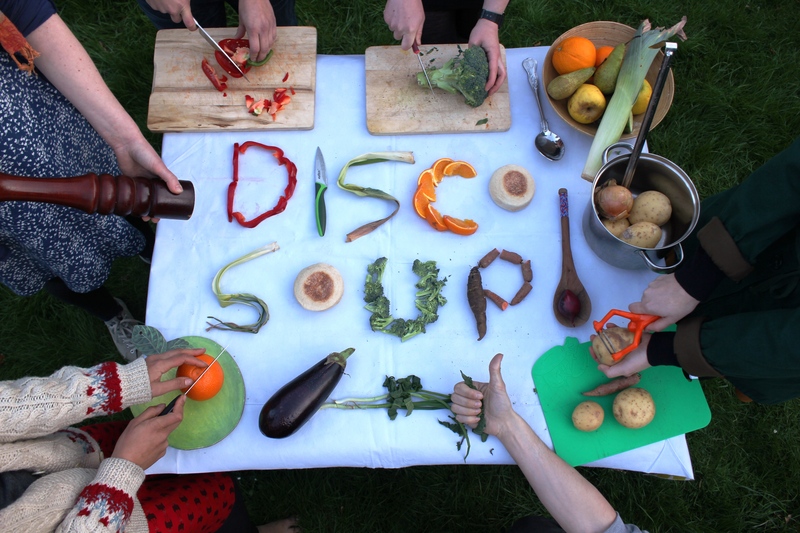 Disco Soup is a free Cook-up & Feast to live music: part of a grass-roots international movement to raise awareness of food waste! Inspired by the Slow Food Deutschland’s Schnippel Disko– the first of it’s kind, there have since been “Disco Soup” type events from Paris to New York and many places in between. Here’s a video from Oxford’s Disco Soup event last year.. The produce comes from wholesalers such as First Direct, bakers including great, local Natural Bread Company and more, and the Oxford Food Bank also donates produce that they cannot redistribute before it goes to waste. Much food goes to waste in Oxford, in catering, in retail and in our homes: and Disco Soup highlights that we can feed many hundreds of people from this produce. How many people can you feed from “waste” produce? In 2013, we put on UK’s first Disco Soup style event – named “FOODISCO” because we had Soup + Abundance Apple juice pressing + Pedal-powered smoothies – which served approximately 600 people soup, juice, or smoothie and donated all leftover uncooked produce to passers-by at the end. When we say ‘waste’ produce, we mean produce that is perfectly edible and fit for human consumption, but which is, for various problems in our current food system (e.g. from aesthetics of ‘ugly veg’ to being surplus to demand) is not getting to hungry people! At Disco Soup Oxford #2 (May 2014) we fed approximately 750 people tasty hot soup! Since then there has been Disco Soup Oxford #3 (Nov 2014) and Disco Soup Oxford #4 for World Food Day 2016 [16/10/16] where we have continued to fill hundreds of bellies and to spread the word about the huge amounts of food going to waste, and organisations trying to do something about it! Thanks to Oxford City Council we’ve got Bonn Square as a venue (opposite Westgate Shopping Centre), and will be open for everyone to join in peeling, dancing & eating: 12 noon – 5pm ! Want to run your own Disco Soup? If we can help out, we’d love to share tips and advice. We were the first group in the UK to run a Disco Soup style event, back in November 2013, and we had a very small team working non-stop and a lot of great volunteers, with support from CAG – Community Action Groups – Oxford’s amazing ‘Transition Town’ style support network. In our May 2014 (second) Disco Soup we again had support from our amazing Community Action Groups project, and we got the brilliant Tristram Stuart, founder of Feedback Global [previously Feeding 5000] and author of Waste: Uncovering the global food scandal to come to help launch it.